Prior to tonight's debut of Lawrence O'Donnell's new show, The Last Word, MSNBC has been running promos where O'Donnell proclaims how much "political pressure there is on everyone involved" in governing decisions and that it leaves him "respecting every one who steps into that room to do that," adding he's "gonna disagree with some of those people" but will always "respect the strength it takes to go on in there." Well "respect" was the last thing O'Donnell displayed to a couple of guests that appeared with him on various MSNBC programs. Perhaps O'Donnell's worst performance came on the October 22, 2004 edition of Scarborough Country when he want lashed out against Vietnam veteran John O'Neill of the Swiftboat Veterans for Truth for daring to challenge then presidential candidate John Kerry's veracity, as he repeatedly called him a "liar" and charged he did nothing to stop the war. According to MSNBC "Morning Joe" host Joe Scarborough, the traditionally left-of-center co-host and daughter of Zbigniew Brzezinski, Mika Brzezinski has had an awakening about the political leanings of the mainstream media. Mika Brzezinski appeared with Scarborough at the Borders bookstore in Falls Church, Va. on June 16 to help him promote his book, "The Last Best Hope: Restoring Conservatism and America's Promise." Scarborough revealed his sidekick's eye-opening experiences about the media. "I'm begging Mika to write a book," Scarborough said. "Seriously - about what she's seen because she's seen it through my eyes for the past two years now. I'm definitely serous here. It's been stunning to Mika who's been in the media for 20 years. She will tell you how biased it is." I'm beginning to see Joe Scarborough's skirmishes with Mika Brzezinski on Morning Joe as mere batting practice for the much more serious battles he undertakes in the evening with Rachel Maddow on Race for the White House. As Noel Sheppard documented, Maddow and Scarborough tangled on April 17th, with Joe possibly having exited the set in the end. The pair were back at it on this evening's "Race," the Air America host this time accusing Scarborough of "tying Barack Obama to Hitler." Maddow's theme throughout the show was that the media has devoted too much coverage to the Rev. Wright matter. David Shuster, subbing for host David Gregory, lit the fuse. On today's Morning Joe, Obama fan Mika Brzezinski did her best to defuse the spot of bother Barack is in over the extremist statements made by his personal spiritual advisor, the Rev. Dr. Jeremiah Wright, Jr.
mentioned that Obama has already distanced himself from Wright. pointed out that the Clinton campaign has its own race-related problems, as with Bill in S.C. and the recent Ferraro flap. insinuated that the Clinton campaign might be behind the recent emergence of the Wright tapes. And then there was my favorite. Mika speculated that the sermon in which Wright used the n-word to make an invidious comparison between Hillary and Obama might have been six years old. That's right. Brzezinski imagined that Wright might have taken to his pulpit to excoriate Hillary back in 2001 or 2002, at a time when Barack was a mere Illinois state senator and the presidency not even a gleam in his eye. As fellow NewsBuster Brad Wilmouth has documented, last night an inspired Chris Matthews declared that in watching Barack Obama speak, "I felt this thrill going up my leg." Joe Scarborough has offered a graphic variation on the metaphor to depict how the Clinton folks might be feeling this morning. It came at 7:05 AM ET during today's Morning Joe, subsequent to a discussion of Matthews' thrill-up-his-leg line. JOE SCARBOROUGH: Look at these numbers; the percentages of victories. You're talking about feelings? If I were running Hillary Clinton's campaign right now, if I were Howard Wolfson, I might have a feeling actually running down my leg. A shocked Willie Geist could be heard exclaiming "oh God!" Hillary Clinton's varying facial expressions during a Morning Joe interview of December 17, 2007 from a diner in Des Moines, Iowa. UPDATE, see below: Shuster says "watch the wink." Sometimes, the smallest gestures are the most significant . . .
Have a look at the freeze-frame. It shows the moment at which the young woman in Iowa this weekend is retaking her seat after posing that planted question to Hillary about climate change. As you'll see, she's flashing someone a conspiratorial wink and smile. "Morning Joe" rolled the video of the moment at 6:43 and 7:01 AM ET today and MSNBC has been replaying throughout the day. But for a driver's license and a wink, was a nomination was lost? An interesting discussion occurred on CNN's "Reliable Sources" Sunday when host Howard Kurtz raised the issue of MSNBC intentionally moving to the left politically, as well as its failed attempt to hire Rosie O'Donnell. Maybe most shocking was conservative radio talk show host Michael Medved saying of the recent events at MSNBC, "I think it shows that they're getting smart." Coming in a close second was Jennifer Pozner of Women in Media and News stating with a straight face "the majority of the people who host shows on MSNBC are either centrists or conservative," and that Keith Olbermann "is a liberal host, but he doesn't necessarily promote liberal candidates or promote liberal projects." 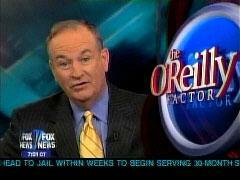 On Thursday's The O'Reilly Factor, during his show's regular "Talking Points Memo," FNC's Bill O'Reilly attacked NBC News/MSNBC for its Iraq war coverage, listing several examples he found worthy of criticism, and defended himself against accusations that some of his recent comments about his show's level of war coverage were insensitive to U.S. troops.